We recently had a discussion in our house about Tequila. The word alone makes me shudder. Once you have big fight with a devil drink like Tequila, you shall never go back. 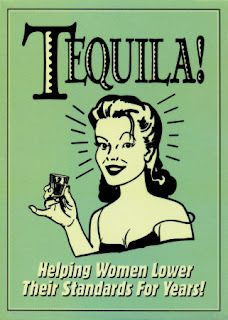 One of my girlfriends asked, "Could your previous hangover from Tequila really be that bad?" It wasn't a hangover. That makes it sound manageable like a mere inconvenience you could counteract with an Advil and a bag of Cheetos. My experience with Tequila was far more bitter. How bitter? Here is a classic story worth sharing again. Dear Mr. Patron: I realize we crossed paths again recently. You seemed kind of interested in getting to know me. I can not reciprocate your feelings. While you tried to seduce me in Mexico, I ignored you. You winked at me over the 4th of July holiday party scene, but you will see that I am quite resistant. Oh, your lovely words of encouragement on my birthday fell on empty ears. These lips shall never touch you. Admittedly, you are sleek and fancy, and considered by all to be top shelf. But alas, we shan't get familiar, and here are the reasons why. The absolute worst is your ugly cousin, Jose Cuervo. I detest him most of all. He knows I don't like him and neither of us really needs a refresher on why I don't like him, do we? In fact, I haven't liked him for a long, long time. Let me explain. I met Jose the summer before my junior year in high school. My friend LL and I went down to watch a rowing event at the University of Washington and somehow ended up on Greek Row. Some boys from Kappa Sigma invited us in for a little early-afternoon Jimmy Buffett party. How could we resist. Older, handsome college boys with Jimmy Buffett? In the door we go. (Foolish, foolish girls). Your cousin Jose Cuervo mixed himself into some frozen margaritas. A cooler, more delicious elixir I had never before consumed. Since wine coolers and light beer was the extent of my alcohol repertoire, the frozen marga-treat-a was divine. Jose told me one more wouldn't hurt. So I had one more. And then one more. Jose told me he tasted even better straight from the bottle. Oh, and since we told our hosts we were freshman in college, they assumed we were already savvy in the ways of Jose's hedonistic world. Jose said it wouldn't matter. He said we seemed sophisticated and mature. Never mind I tripped over a rug in my attempt to sashay over to a cute boy, Jose said no one even noticed. Jose said he would refresh me. He told me I was pretty. And the best dancer. Ever. Jose said to drink and dance. I did. Jose said that it was hot in here and why wear my sweater when a tank top is fine. I listened, oh so closely. Jose had a firm grip. And then, Jose turned against me. He told me to take a catnap. In the middle of the floor. Then he said goodbye. I asked him to help me get home. He laughed and said he was too busy with other party guests. Jose let two other people carry me to my car and deposit me on the floorboard. LL had to drive us home. Jose told me to open the door at a traffic light. In the middle of 45th. With hundreds of cars around, since this was the University District of Seattle after all. Jose told me the only way to feel better would be to crawl out of the car. And throw up. On the pavement. In the middle of one of the busiest intersections we could find. Then Jose told me to get in the car. But he didn't tell me I had barf on my shirt. LL pulled off on a residential side street. Jose told me how calming the sidewalk would feel on my face. He told me to lay down. He told me to let that dog lick my mouth. I barely got back in the car. Jose didn't warn me that we would pass my parents. Jose merely laughed and said "Arriba! Arriba!" My parents did pass us. And LL pulled over. My mom came STORMING to the car inquiring on my whereabouts. Jose didn't tell me to keep quiet. Jose told me to speak up. Share my thoughts. He said I sounded clear, crisp, intelligent. My mom looked at me, looked at LL, and asked what was going on. LL told her I was drunk. Thanks friend. I tried to tell my mom about Jose. I tried to point him out. But he had disappeared. Left me with a sordid tale, bad breath, and a shirt I would be soon throwing away. Oh, and punishment. I never saw him again that year or the next. And then, as a freshman in college, I saw him resurface. He must have followed me to a party. Me, all sunny and bright. He, with all his liquidy amber glow. He came onto me. He said he was delicious. He assured me he had changed. He said it would be different this time. He asked me to dance and after ignoring him for hours, I gave in. He told me we would take it slow. LIAR LIAR LIAR. Jose told me drinking was fun but shots were better. He told me dancing was fun but dancing on tables was better. He said to play Thumper. He said to play Quarters. He said smoke cigarettes. He said I looked hot. He said I was the funniest girl in the world. He said play air guitar. He said pee in the front yard. He told me those photos of me drinking shots wouldn't matter, they would only make me laugh. Oh, Jose, he is one smooth talker. I had a headache that lasted one month. I cursed him and the day I laid eyes on him. I saw him influence others to run naked and jump off roofs but not me. He tried to corner me on other occasions. I screamed in his face. He tried to up the ante by introducing me to his friends Don Julio and Dona Carlota. I spit on him. Jose Cuervo is a sadist. I will warn others. And while I do make a fantastic margarita (just ask JohnnyMac), and while we stock Cabo Wabo in our house, I know better than to dip in myself. So Mr. Patron, your interest in me is a dead end. I am wise now. And tell your horrid cousin, Jose, I don't even want his aroma within 20 feet of me.